Telegram Gets Banned In Russia, Promises To Circumvent Ban Using "Built-in Systems" - AndroGuider | One Stop For The Techy You! Telegram Gets Banned In Russia, Promises To Circumvent Ban Using "Built-in Systems"
Telegram hit 200 million monthly active users last month. Around the same time, Telegram was risking getting banned in Russia after its appeal against security services FSB was denied. In 2016, Russia President Vladimir Putin signed laws to counter terrorism. One of the implications of the laws required messaging apps to provide government authorities with a way to decode user communications. Telegram rolled out end-to-end encryption in 2013 and FSB asked Telegram to hand over the encryption keys so that the authorities can decipher user correspondences. Citing threats to user privacy and freedom, Telegram refused to abide. The messaging app also said that it was built in a way that it didn't have access to the user's encryption keys. Telegram says that only the users have access to the keys. 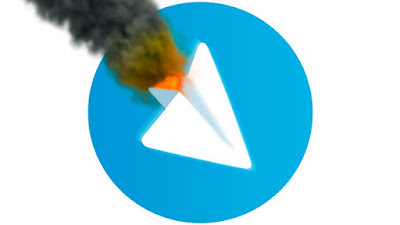 Following Telegram's refusal and claims of Russian authorities that the messaging platform was used for plotting a terrorist attack in St Petersburg (in April 2017), Russia threatened to ban Telegram. Since then, Telegram has been fighting a court battle with the FSB. Last month, the Supreme Court of Russia ruled in favor of the FSB and ordered Telegram to comply. The Supreme Court ruling set April 4 as the deadline for Telegram to give away the encryption keys, failing to which it would be banned. Now according to Russian news agency TESS, a court has permitted communication agency Roskomnadzor to block Telegram. 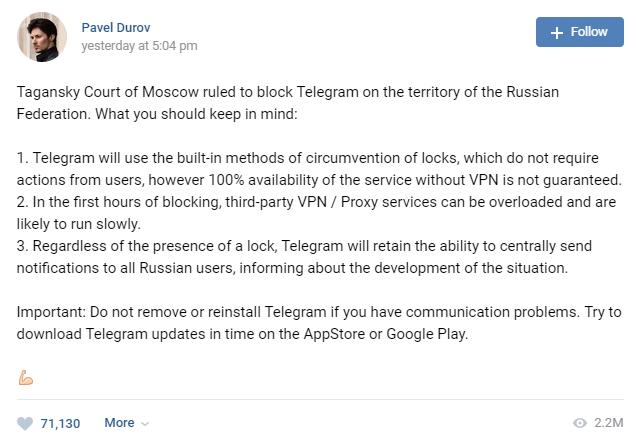 In addition to his post on Telegram, Durov wrote on Russian based social network VK that Telegram will find ways to get around the ban. Durov encouraged users to install all app updates and use a Virtual Private Network (VPN). At the time of writing this article, Telegram could be accessed in Russia without the use of any workarounds, but this could change anytime soon. Telegram's lawyers spoke to TASS and confirmed that they would be appealing the ban. Till a new order comes into existence, Telegram will remain banned in Russia. The messaging app has over 9 million users in the country.